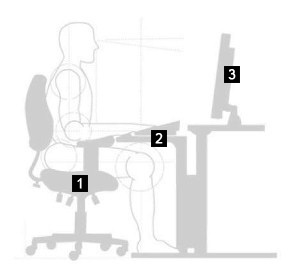 Ergonomic workstation systems are designed to encourage neutral postures. to the floor, and the wrists and hands are level with the elbows. Improper posture, seating discomfort, and awkward hand and keyboard positions can result in early day fatigue and reduced efficiency. Long periods of repetitive work can lead to hand, neck, and back pain. Ergonomics, an applied science focused on humans interacting with their work environment, has provided an array of information critical to the design and proper use of office equipment, furniture and computer accessories. These 'ergonomic' products can dramatically reduce discomfort and the resulting loss of productivity when used properly. We have created this easy-to-follow guide which is designed to help you organize your work environment so you can develop a neutral posture keyboard technique that will help you be safer, more comfortable, more efficient, and reduce discomfort issues. Before we begin our review of the neutral posture keyboard technique, take a few minutes now to study your work environment. Keep in mind that your work environment may be a little different than the one illustrated here, but the same principles apply. The most important factor in determining your success with the neutral posture keyboard technique is establishing the correct height and distance relationships. Neutral posture keying technique is as important to your comfort and efficiency as is the correct adjustment of the rest of your equipment in your work environment. 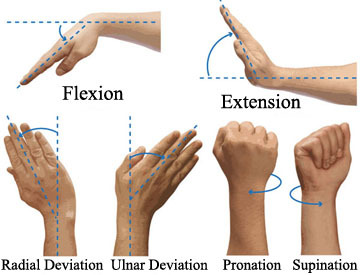 Take a moment to study the different hand position diagrams. Place your hands on the keyboard. If they are not parallel to your upper legs and to the floor, then you may be experiencing a flexed or extended wrist posture. If so, you will need to readjust the height of your chair and/or ergonomic keyboard system so they permit a neutral wrist posture. Your upper arms should be relaxed by your sides, elbows at a 90% angle, with your wrists straight or in a 'neutral posture'. Once you have attained a neutral wrist posture, it may feel a little different than what you are accustomed to. This is perfectly natural. If you continue to use a neutral wrist posture with the support of a wrist rest (if you are experiencing contact stress on your forearms from the edge of your desk), you will very soon become comfortable with it and your efficiency will quickly improve. Be patient, stick with it, and you will soon notice discomfort improvements. Some work environments can be easily adjusted to match your specific physical requirements. Others will require a little imagination and ingenuity. Take a few minutes now to find out which parts of your environment can be adjusted. Pay particular attention to your chair height and the height position of your computer monitor. If you are unsure about how your work environment might be adjusted, ask a co-worker or your supervisor for assistance. of you at the appropriate height. Don't be hesitant to improvise. something to raise your monitor to the correct height. Once you are familiar with the adjustment systems, begin by adjusting your chair. Then adjust your ergonomic keyboard system, and finally, your monitor height and position. Chair: Adjust the height of your chair so your upper legs are parallel to the floor. Adjust the back support so your back is firmly supported and angled slightly backward while your feet are fully supported on the floor or on a footrest. 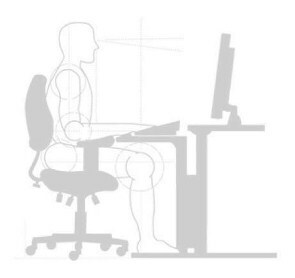 Keyboard: The height for your ergonomic keyboard system, and any other input device, such as a mouse, should be set so your hands, wrists and forearms are in a straight line and are level with your elbows when your arms are comfortably at your sides. The mouse should not be on a different level from your keyboard. Monitor: The top of the monitor screen should be even with your forehead and directly in front of you. Your eyes should focus on the screen at a slight (about 15 to 30 degrees) downward angle. After you have made all the adjustments and are working in these 'neutral postures' you will start noticing immediate improvements in your discomfort levels, energy levels and productivity, and reduction of your fatigue levels. If you are still experiencing discomfort issues after these adjustments have been made, you may want to talk to your supervisor about getting an Ergonomic Assessment to determine where the root cause of your discomfort is coming from.